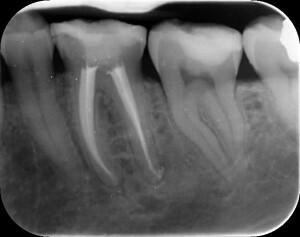 Root canal treatments are those associated with the nerves of the teeth. Usually when the nerve becomes infected, because of decay, trauma or gum related disease it is necessary to remove it. 1. The canals are then cleaned out and disinfected with medication under local anaesthetic. 2. They are then filled with a specialised material to prevent further bacteria getting inside them. 3. The tooth cavity is further sealed with a filling. Usually this would require 2 visits, maybe 3 depending on the tooth, and how infected it is. Will I require any further treatment? After the root canal treatment, the tooth may need extra protection, as they tend to be weaker structurally. This may be in the form of a crown. 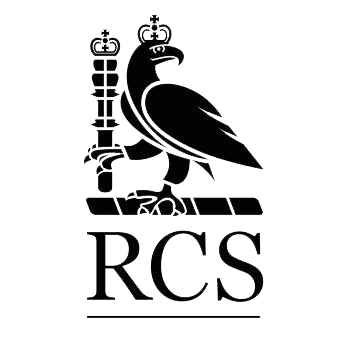 Sometimes after root canal treatment, you may notice that the tooth becomes slightly discoloured and grey in appearance compared with the adjacent teeth. In this case internal/external bleaching can be considered. Root canal treatments at K Dental Studios are undertaken by Cesar Munoz. Click here to find out more about him. 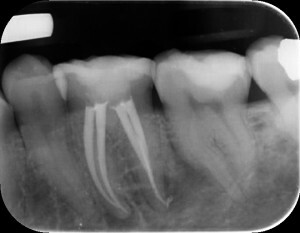 Lower Left First Molar before Root Canal Treatment showing signs of infection at the root apicies. 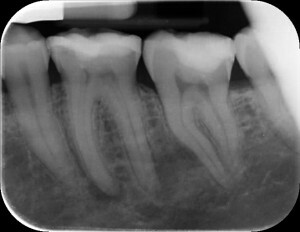 Root Canal Treatment completed by Dr Munoz (Root Canal Expert). Lower Left First Molar showing signs of healing at the root apicies 6 months after Root Canal Treatment.